The Center for Understanding in Conflict, formerly The Center for Mediation in Law, was formed in 1981 as a non-profit educational institute dedicated to integrating mediative principles into the practice of law and the resolution of legal disputes in commercial, family, organizational and other legal and non-legal settings. 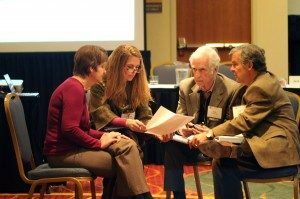 Originally, the Center conducted introductory and advanced training programs for lawyers, offering its unique Understanding-based approach to conflict resolution. The application of this approach has now expanded to collaborative practice, non-profit organizations, ombuds work, traditional legal representation, and other settings in which professionals wish to help parties work through conflict in a different way. In the United States more than 4,000 lawyers, law teachers, judges, and other professionals have been trained in this method. And since 1990, the Center has trained conflict professionals in Germany, Austria, Switzerland, Israel, Italy, France, and Russia. Center trainers have also used the model in trainings at Harvard’s Program of Instruction for Lawyers, the Harvard Negotiation Insight Initiative, the American Bar Association, and the World Intellectual Property Organization. The Center offers ongoing support groups, peer groups, and advanced training programs, both live and virtual. 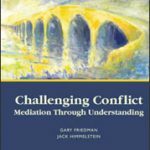 In Gary Friedman and Jack Himmelstein are co-authors of Challenging Conflict: Mediation Through Understanding, published by the American Bar Association, 2008, in cooperation with the Harvard Program on Negotiation. This book is a comprehensive introduction to our model, including explanations for our core concepts and case studies describing each stage of the process. “Using interesting and at times intriguing case examples, Himmelstein and Friedman show how a focus on deeper understanding and joint problem solving can be the keys to unlocking difficult conflicts. They urge mediators to engage with disputants in looking at their conflicts rather than take away the problem from them. This book is worthwhile and engrossing reading for anyone interested in developing an effective approach to mediating difficult disputes.” – Bernard S. Mayer, Werner Institute, Creighton University, author of Beyond Neutrality.